A man died Wednesday after fleeing police in Lowell, Massachusetts, according to authorities. The Middlesex County District Attorney's Office says crews responded to a crash around 6:50 p.m. on Woburn Street at the exchange with Interstate 495. A Billerica man in his 30s, whose name is being withheld pending family notification, was pronounced dead at the scene. Officials say police tried to stop the Volkswagen Jetta for a registration violation on Billerica Avenue in Billerica. The man allegedly took off toward Lowell. 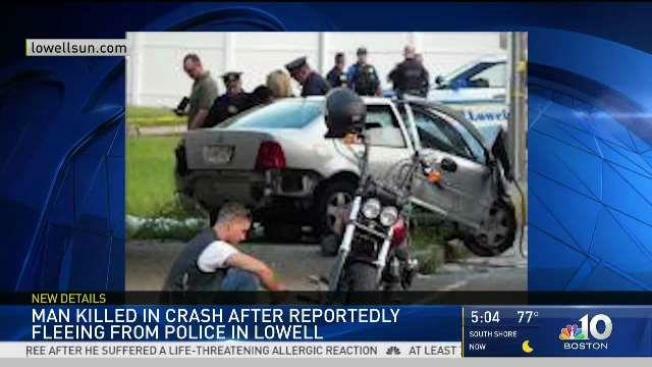 When police caught up with the car in Lowell, they found he had crashed into a second vehicle and then a concrete barrier. The driver of the other vehicle was taken to a hospital with non-life-threatening injuries. Authorities are continuing to investigate the cause of the trash.